Combustion engines, like those found in most cars, transfer power to the vehicle’s axle, which turns the wheels. Hydrostatic transmissions found in most modern tractors and zero-turn mowers, work by transferring power from the engine to hydraulic pumps which use liquid pressure to move the wheels. There’s no need for gears, and changing speed is smooth and efficient. With any transmission, things can go wrong. The first step is to read your Operator’s Manual. There are many different types of equipment with hydrostatic transmissions, and we can only offer general advice. Your tractor operator’s manual will have information specific to your make and model, and will offer helpful information about where to find filters and other parts that might require servicing are located on your tractor or lawn equipment. Hydrostatic transmissions include mechanical parts such as a differential and a drive axle, plus rubber or metal hoses the liquid is pushed through. Failure of any mechanical component, a broken hose, or clogged filter will cause tractor hydrostatic transmission problems. But the most common issue will be the oil itself. In the transmission section of your operator’s manual, you’ll find a section that covers oil viscosity. Here’s an example from a John Deere manual. Note that, while temperature affects viscosity, the right oil has enough range to operate in any reasonable weather. Here are some basic troubleshooting tips to fix your hydrostatic transmission lawn tractor problem fast! Zero turn hydrostatic transmission problems can start with air in the system, a condition known as cavitation. When the pump is full of air instead of oil, it can’t generate the pressure needed to provide power. This is pretty common in zero-turn mower transmissions. After your mower has been stored for the winter, it’s a good idea to purge the transmission before use. It’s also a good first step if your motor is sluggish or slow. NOTE: If your mower or tractor has a transmission that must be removed for service, be sure to purge after it is serviced and before you use it. Park the mower on level ground, set the parking brake, and put the rear on jackstands. Make sure the oil reservoir is properly filled according to specs. Disengage the transmission (check your operators manual to see how this is done). Sit in the operators seat and start the engine. With the engine running, move throttle control to slow position. Position the motion control levers in neutral (N) and disengage clutch/brake pedal. Push motion control levers forward all the way and hold for five seconds. Pull motion control levers to full reverse position and hold for five seconds. Repeat steps 6 and 7 three times. This purges any air from the hydraulic transmission system. Put the control levers in neutral (N). Shut the engine off and set the parking brake. Check the oil and top off if necessary. Remove from jackstands, start the engine, and disengage the brake. Move control levers forward and roll about 5 feet. Then slowly reverse about the same distance. Return the levers to neutral and repeat this steps three times. You’re done! 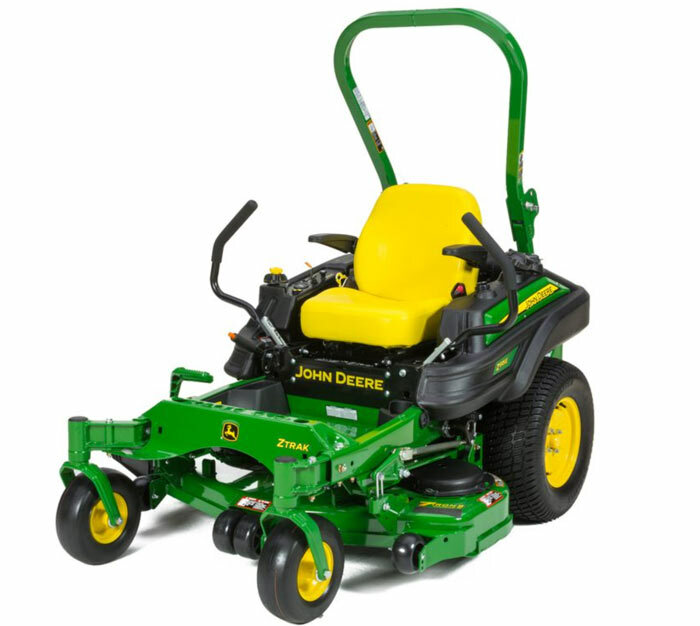 The air is purged from your system and your zero-turn mower is ready for action. If your system is purged and you still have a problem, it’s time to do a little basic troubleshooting. Start with a complete visual check of the hydraulic system. Check the oil level and add oil if needed. Inspect the hoses and connections for damage or signs of leaks. Clean pump cooling fins with a rag, brush, or compressed air, and check for damage. Sluggish operation is often due to old or overused fluids. If there are no signs of fluid leaks or damage, it may be time to change your hydraulic and steering fluids. If you need help troubleshooting your tractor’s hydraulic system, call your dealer. Their service department should be able to ask the right questions, give suggestions, and you can make an appointment for service if necessary. Some things are beyond DIY. When it’s time to call in an expert, don’t hesitate. 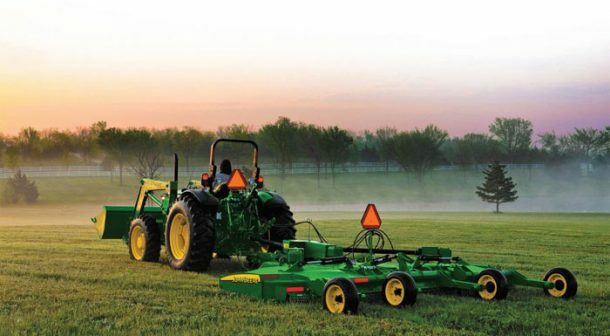 Your tractor represents a significant investment in terms of both money and delay. It’s one of those farm equipment essentials you simply can’t do without. When it needs to be fixed fast and done right, call an expert!